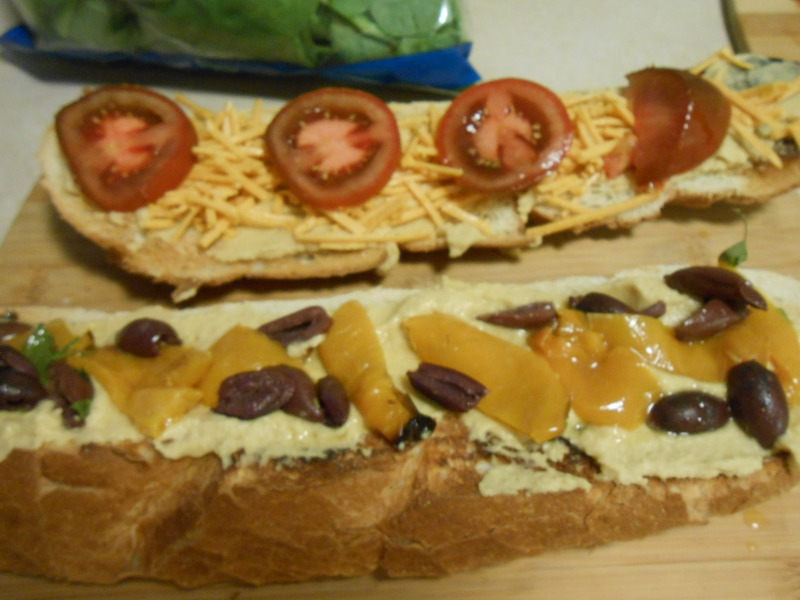 A foot long broiled sub roll smeared with hummus, then layered with Daiya Cheddar Cheese Shreds, kumato slices (dark tomatoes), Pickled Roasted Yellow Peppers and Kalamata olive halves. Topped with fresh spinach! 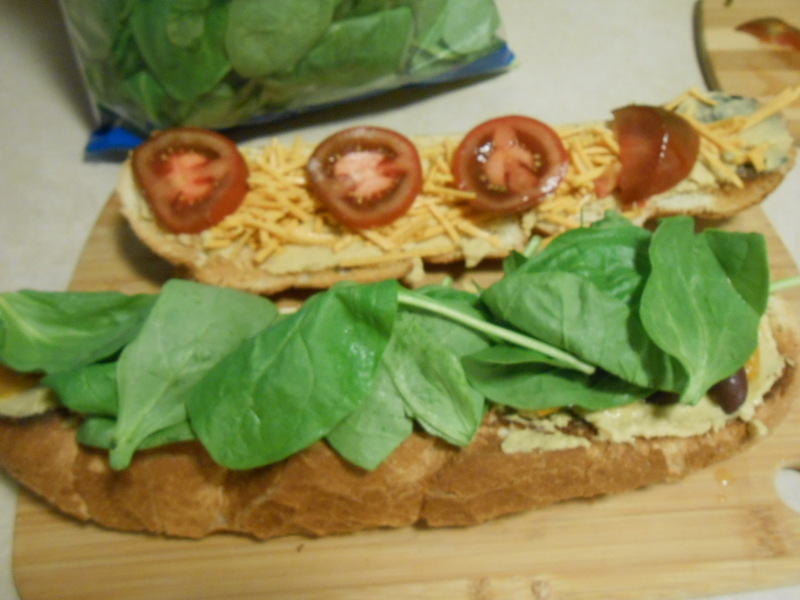 Spread both halves of broiled sub roll liberally with hummus. Top one half with cheese shreds, then top that with slices of kumato. Top the second half with pieces of pickled peppers and Kalamata olives. Top the olives with spinach, close, cut and serve. Notes: The cheezy taste (almost meaty) in this sub doesn’t only come from the Daiya cheddar, but the combination of the cheese, with the cumin seasoned hummus, the Kalamata olive and the hint of clove in the pickled peppers. It surprised me. 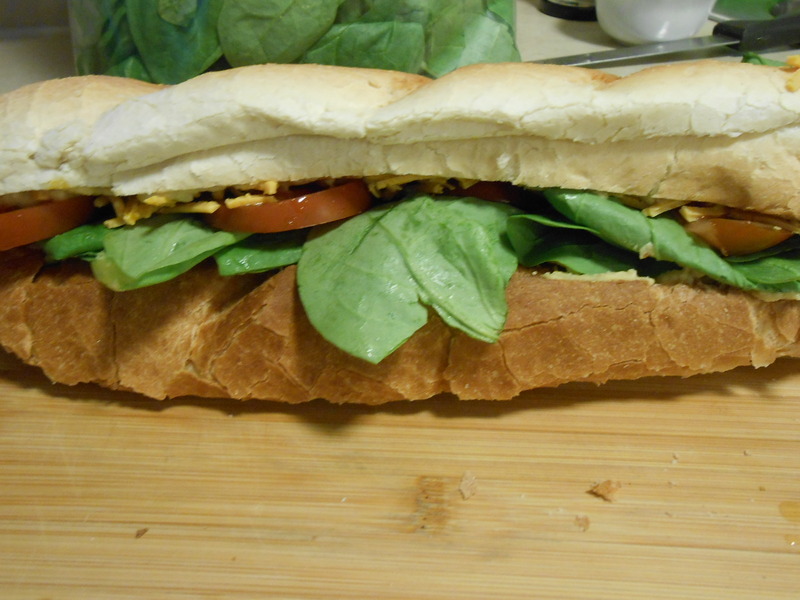 In a blind tasting people would not think this sandwich was all vegetable. I didn’t melt the cheese on the roll, because I wanted the texture of the shreds, which added to the meaty texture. Kumato is basically an heirloom tomato, dark in color, thicker skinned than most garden variety tomatoes, and juicy in the middle. It looks and feels more like a plum than a tomato. It’s simply delicious and holds up particularly well in sandwiches, whereby other tomato slices tend to fall apart.